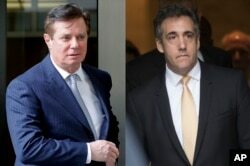 Washington is absorbing new revelations concerning the Russia probe revealed in court documents regarding U.S. President Donald Trump’s 2016 campaign manager as well as his former personal attorney, both of whom have pleaded guilty to a variety of federal crimes and provided information to prosecutors. Trump himself continues to deny wrongdoing. None of the prosecutorial briefs made available to the public on Friday answer the core question of the Russia investigation – whether Donald Trump colluded with Moscow to sway the 2016 presidential election. But they do contain a multitude of assertions. Special Counsel Robert Mueller accused former Trump campaign manager Paul Manafort of lying about interactions with a Russian operative as well as his contacts with Trump administration officials. The document is heavily redacted, suggesting more information will emerge. Separately, Mueller asserts that former Trump lawyer Michael Cohen detailed Trump’s business dealings in Russia well into the 2016 campaign, as well as Cohen’s repeated lies to congressional investigators in order to shield Trump from scrutiny. Federal prosecutors, meanwhile, said Cohen paid hush money to two women to suppress claims of sexual encounters with Trump. The brief states that Cohen acted at Trump’s behest in violation of U.S. campaign finance laws. In these 2018 photos, Paul Manafort, left, leaves federal court in Washington, and attorney Michael Cohen leaves federal court in New York. Trump himself did not seem troubled by the revelations. “We are very happy with what we're reading, because there was no collusion whatsoever. There never has been. The last thing I want is help from Russia on a campaign,” he said. The president’s take was not echoed by lawmakers of either political party. Rubio added that the search for the full truth must continue. Democratic Senator Chris Murphy said the Russia probe has entered a new phase. “I think it is important for us to get the full report from the special investigator, but let’s be clear: we have reached a new level in the investigation. The special counsel is starting to show his cards, and these are very serious allegations. This is a president who is now named as an unindicted co-conspirator, the allegation is he committed a least two felonies to try to manipulate the 2016 election,” Murphy said, also speaking on ABC’s This Week. Murphy is backing legislation that would make it harder for Trump to fire Mueller, who has led the Russia probe since May, 2017.